So where does that data come from? 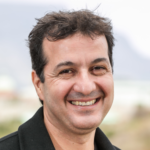 How does the data get into Quintessence? And how is that data made uniform? Quintessence data feeds helped me to close one of our biggest deals. I presented our product to a prospective client. I showed them examples of our data feed module. I explained how versatile data feeds are, and how easy data feeds make it to import data. The client’s IT team had been given a project that involved importing MorningStar® data into their system. The team estimated that the project would take six months. I asked whether I could take on the project as a 40-hour proof of concept and use our data feeds to accomplish the task. 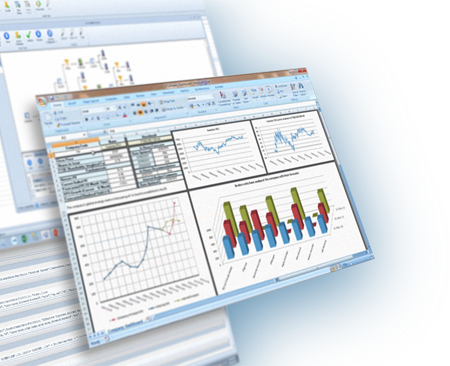 I arrived on the Monday, configured the feeds, and by late Friday afternoon I had Excel reports in place that presented the imported data – MorningStar® fund holdings and return data. OK – truth be told, I spent 60 hours on the project and not 40 hours. But this was a project that the client had anticipated would take an IT team six months! Needless to say I closed the deal. The investment research process receives data from one or many third party data providers, for example, Reuters, Bloomberg or the London Stock Exchange. Quintessence data feeds are used to import this data into Quintessence. Information from different providers can arrive in different formats and as single or multiple files. 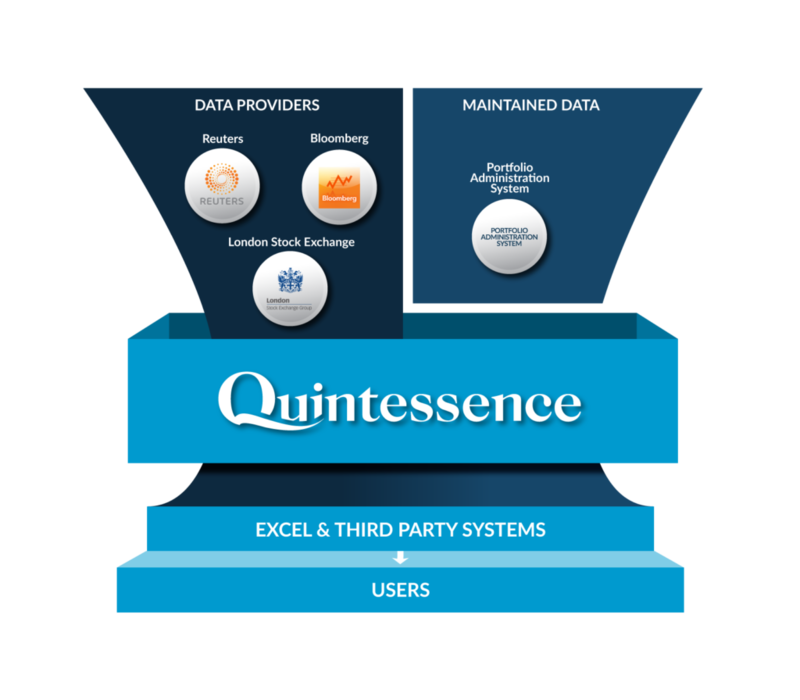 Quintessence data feeds cater for these different formats and map the data onto Quintessence structures. Data feeds can be encapsulated into tasks that run once off, or are scheduled according to specified intervals. International best practice decrees that there should be one ‘golden source’ for data. If a data provider consists of a maintained data source, for example a portfolio administration system with its own data warehouse, there is no need to import the data into Quintessence using a data feed, as this would lead to duplication and violate best practice. In this instance, Quintessence can ‘see’ and reference external data using virtual feeds, mapping the data to Quintessence structures in memory as required. 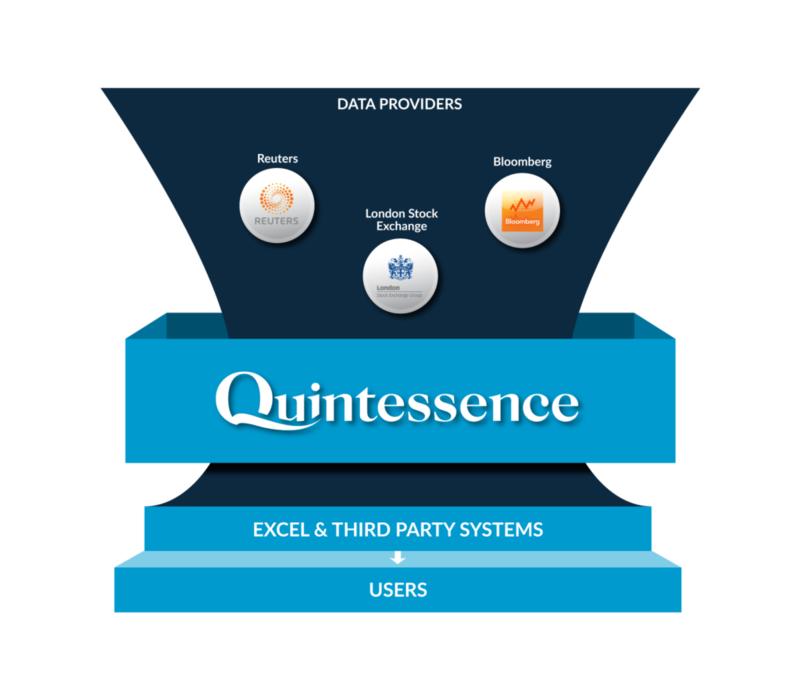 Quintessence data feeds allow the collection of disparate data from multiple formats into a single uniform integrated warehouse. The feeds can be actual (import data into the Quintessence warehouse) or virtual (reference external data). Some of our clients warehouse all of their data in Quintessence. Some reference all of their data from Quintessence. Some combine both methods. In all cases, all team members can access the same data from one integrated platform. Contact us for more information or read about Quintessence features.